LVPI President Peter Cayco said national coaches Shaq Delos Santos (women’s) and Dante Alinsunurin (men’s) now have a ‘good problem’ at their disposal in the wake of the large number of players who showed up and signified certified their intentions to play for flag and country. Even more surprisingly was the attendance for the men’s squad held over the weekend at the University of the East and supervised by Rod Roque, the director in-charge for the men’s Philippine team. Judging by the number of players who showed up gives the volleyball federation the optimism of at least winning a medal in the volleyball events of the SEA Games scheduled Nov. 30 to Dec. 11. “Podium finish ‘yan for the men’s and women’s. 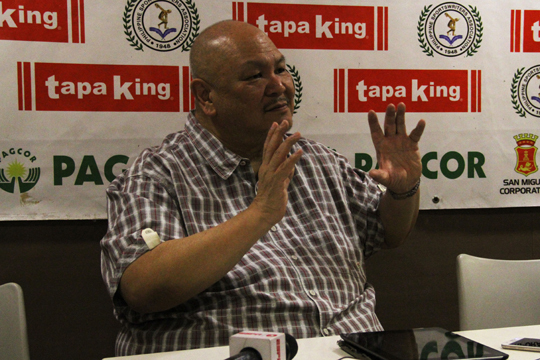 Kulay na lang ang pag-uusapan,” announced Cayco at the Philippine Sportswriters Association Forum on Tuesday at the Tapa King Restaurant at Farmers Plaza in Cubao. “But we’re confident kami na podium finish,” added the LVPI president in the session presented by San Miguel Corporation, Tapa King, and the Philippine Amusement and Gaming Corporation. Cayco mentioned powerhouse Thailand, Indonesia, and Vietnam to crowd out the host country for the podium finish. The last time a Philippine volleyball team won a medal in the SEA Games was in 2005 when the country also hosted the biennial meet. The LVPI is leaving nothing to chance anew with the multi-sports event to be held here again after 14 years. A similar team will also be formed in beach volleyball competitions, two men’s and two women’s squads. Try-outs for the beach volleyball teams will be made in two weeks’ time after the coaching staff is chosen. Meanwhile, the list of the 20-man pool for both the men’s and women’s national teams shall be submitted by the coaching staff to the LVPI anytime this week, according to Cayco. “I don’t want to pre-empt the coaching staff, but I think what they saw, yung wish list nila nandun both in the women’s and the men’s team,” he said.